Margaret will have to forgive me for having fun with some video clips I captured on my iphone while we visited Colorado a couple of weeks ago. This video was too good not to share. While stopping for lunch in Breckenridge, Colorado, we noticed a good number of fish in the stream that runs through town. I was not sure we should fish for them, they were right in the middle of town. But, my wife, Margaret, suggested we try it. The first time she had said “can we fish?”, I decided to propose to her; this time, together on a 10-day fishing expedition and her still asking me to fish more, I was once again assured I had the right companion with me. After “warming up” by catching a few small trout at the head of the pool, Margaret said she wanted to try the larger fish we had seen at the tail-end. There was a nice pod of them, ranging from some 18 to perhaps as big as 25 or more inches. I confess I was a bit apprehensive about targeting them in a body of water that reminded me of a lake. Past experiences told me that if a real large fish wanted to run in that type of water, he would run and break off because we wouldn’t be able to follow it. Margaret didn’t know any better and insisted she wanted to catch one of the large trout. I could not reasonably say no to that request. Perfectly natural dead drifts did not attract those fish. They were too used to seeing flies going by them on a regular basis, I presumed. I told her to try manipulating the fly a bit. She tried a couple of things I had taught her in the past, but these fish were wise to us and didn’t give the fly a second look. Not being one for changing the fly (we were using the Ishigaki Kebari), I kept giving her some suggestions on things to try. I knew one of those fish would succumb to the right movement on a well presented fly. Yes, I just felt that confident that there was no need to change flies.”Try skating the fly on the surface” – nothing. “Try pulsating the fly up and down” – nothing. “Try casting it upstream and let it sink slowly” – nothing. She started losing confidence, but not hope. Not knowing how to explain what I wanted her to try next, I held Margaret’s hand and said, “Ok, let’s try this…” and intuitively proceeded to cast the fly, let it sink about 5 inches (approximately where the fish seemed to be), and after it sank, together, we twitched the fly twice to indicate it was “live”, and then we let it “die”. The fish reacted! Right when we did this they swam around the fly in circles as if sharks checking out their prey. THIS WAS IT! That was the trigger for those fish, on that water, on that day. I had caught fish this way before. And, interestingly, the fish behavior had been exactly the same. 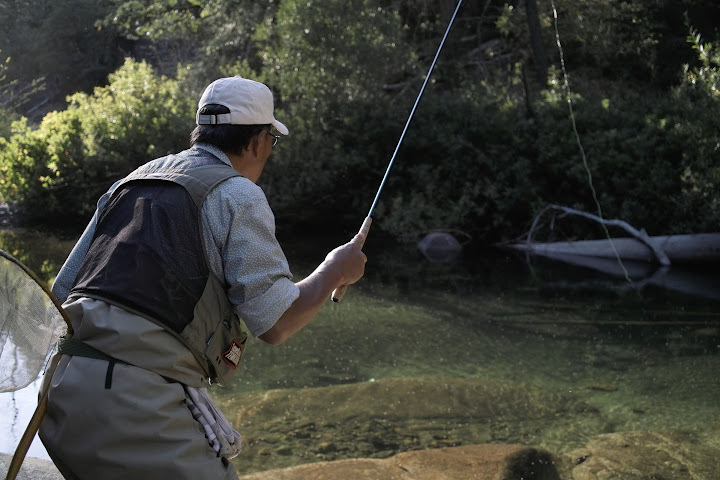 Once, when fishing with Dr. Ishigaki in the Sierra Nevada, we came across a pod of trout in some very calm water in a stream we were fishing. Dr. Ishigaki tried a few times, bu no strikes. Thinking the fish were either spooked or there was nothing we could do to entice them we prepared to move, but then I noticed they were still feeding. I asked if I could try it. I cast, let the fly sink a bit, twitched it a couple of times and let the fly die. This caused the fish to circle around it, and one of them took my fly. This was a very intuitive thing for me to do, a technique I believe I learned with my dad as a young kid when he told me to move the bait a couple of times to get the fish interest and then stop to let the fish take it. Margaret and I cast the rod together once more and repeated the motion. This time the twitches a bit more vigorous, moving the fly twice in succession, about 5 inches each time. After the twitches I let go of her hand. As the fly “died” and started slowly sinking, its hackle relaxing and opening, I suddenly noticed the fly had disappeared. The fly was in the fish’s mouth! The fight was all hers. Margaret handled it beautifully, masterfully even! She fought the fish with a “beginner’s mind” – the state of mind when one doesn’t know that she “should” run like crazy with a fish of that size if not using a reel, when she didn’t think of the fish as “so large that it couldn’t be tamed”, but rather as a fish she had caught and she had to land. The beginner’s mind is a a state of mind when the intuitiveness of tenkara takes over and we don’t over-think the solution to what is a very simple problem. But, she kept in mind that one point I had shared with her many times previously: keep your arm close to your body when fighting a fish, don’t extend it high up. That’s the only way to keep full control of the fish, and to eventually be able to reach the line and land the fish. The rod held, of course. She was using the 13ft/14ft7in Ito tenkara rod. A huge grin adorned her face. Margaret was ecstatic when she landed that fish. Yet, she looked a bit sad at the same time. I asked her what was wrong, expecting her to say she felt bad for the fish she had just hooked. Instead, she told me it was not really “her fish”, that I had caught it for her. I knew that I didn’t, and that with a fish of that size the very hardest part was landing it and that she did it all alone. But, she couldn’t shake it off, it was my fish. “Well, I was just showing you something new, you caught it”, I told her. “But, YOU caught it”, she replied. This time Margaret cast precisely in the middle of the pod. The landing of the fly was soft and not an inch of line seemed to touch the water as the fly landed 25ft away. The presentation was perfect. And so was the technique that followed. As the fly landed, without imparting any additional drag on it, Margaret let the fly sink a few inches. As soon as it was just at the right height (where the mouth of the cruising fish seemed to be), she gave it two firm twitches and let the fly die. Too much to resist, the fly once again disappeared. A fish took her fly and she set the hook. She proceeded to fight the fish for a few seconds. It looked like it was going to be even larger than the first one, a fair amount larger actually. She kept her same stance, crouched low to prevent the fish from getting spooked. For a second I thought she had it, and then the fish let go of the fly. This second fish was meant to get away. The reality of the matter is that we all lose the occasional fish, small or large. The large ones just tend to have a bigger impact on us. I turned the camera on just in time to catch a moment that has provided Margaret and I with a lot of laughter so far, and hopefully it may be slightly funny to you too. As the fish let go of the fly, the great force with which it was pulling was unleashed, and Margaret fell on her behind right on the puddle that criminously waited below her. Readying to proceed on the rest of our trip, I told her “now you have a complete fish. You lured the fish and you also landed it, all by yourself.” Margaret was content with that. Should she have landed both fish, the first fish would have been mine, the second hers. This way she caught more fish than I, and one whole fish was entirely hers. 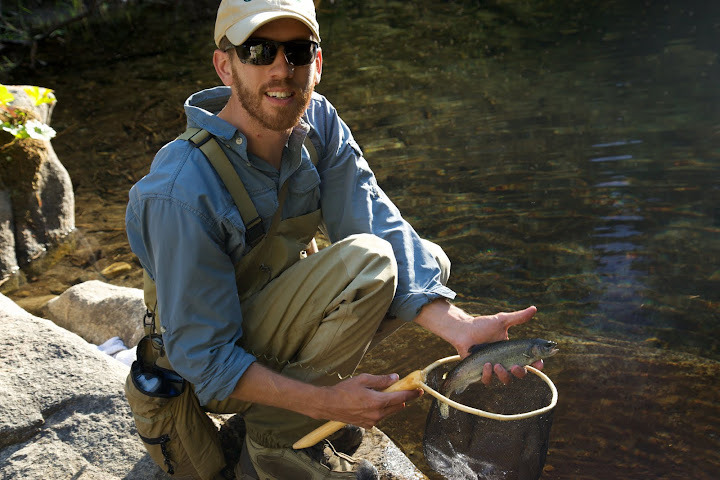 That video distills the essence of tenkara for me: the simplicity, the effectiveness, and the JOY! Actually, she is quite graceful. I would have rolled over and into the water with the hook stuck to my lip. She just plopped down cleanly and saved it. Very cool fish she landed. LDR = Long Distance Release. Great post and writeup about strategizing about presentation techniques! BTW, I know that exact pool in Brekenridge. I’ve stood there many times, saw tons of trout but thought you weren’t allowed to fish there. Now, I’m kicking myself! Great job Margaret! We were a bit suspicious too. But, we stopped for lunch at a cafe right on the stream and asked the owner if fishing was legal there. She said it was totally fine but should be catch and release. Then we saw three other people fishing briefly, one with lures, one fly-fisherman and one with bait, though we didn’t see anyone hooking a fish. It actually took us a little while to start fishing there. Been here plenty of times. There are “no fishing” signs everywhere and, if you didn’t notice, there are gumball machines filled with dogfood up on the bridge leading to the restaurant so small children can feed the trout. So you are basically catching fish out of a domesticated fish hatchery.